With a rising European expat population, it’s only natural that Hong Kong has become a hotbed of French restaurants. Prim-and-proper dining rooms in five-star hotels have pervaded our city for decades. But, in recent years, particularly with the influx of the French community setting up shop in and around the western region of Hong Kong Island, casual French fare served in hidden side-street restaurants has been cropping up like wildfire. Serge et le Phoque (‘Serge and the Seal’) aims to strike a fine balance between serving delectable, sophisticated French cuisine and avoiding the stuffy ambience of numerous Michelin-starred predecessors. Restaurateur Charles Pelletier and chef Frédéric Peneau (from Parisian hotspots Le Chateaubriand and Café Burq) set up shop on a street next to the busy Wan Chai wet market, aiming to provide a relaxed, laid-back setting for some of the city’s busy bees who just want a casual environment for some top-notch food provided by chef Christophe Pelé, formerly of La Bigarrade in Paris. Without a sign and in an unexpected location, it’s slightly difficult to find. But once you happen upon it, the knockout space is impossible to miss. Floor-to-ceiling windows and retro mint-green booths, with flickering candles placed on wooden tables, face the sidewalk. As you find your way to the hidden glass door and step inside, you’re greeted warmly by the host (who currently happens to be Pelletier himself) while banging electronic beats hum excitedly overhead. The restaurant’s minimal lighting strikes a wonderful balance for those who want some romantic mood-lighting but want to know what their food looks like. In that dim glow, we peruse our dinner selections. Serge et le Phoque currently offers a three-course set dinner for $490 per person. By mid-September, there will be a la carte small-plate selections for sharing, from light starters like the tiger prawn ceviche bathed in avocado, red onions, coriander and raspberry juice to a heavier serving of beef with shiitake and sake, punched up with chives and red onion juice. As per the norm for authentic French cuisine, the portions are a tad slight but we find each dish to be extremely satisfying. 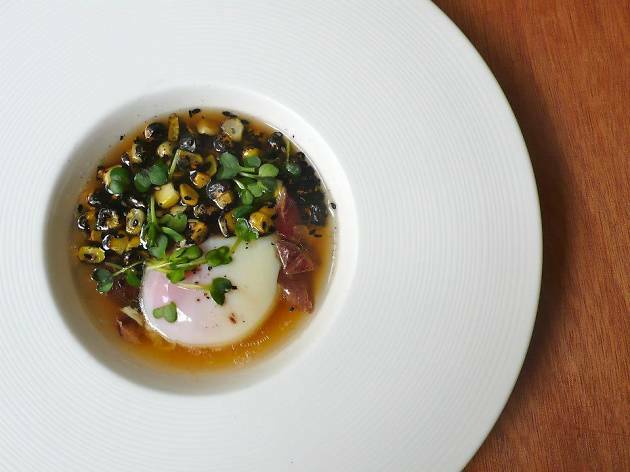 The hen egg, enveloped by squid ink and slightly sweet smoked corn, partnered with a snappy fried fish and lime, is a gooey dream. 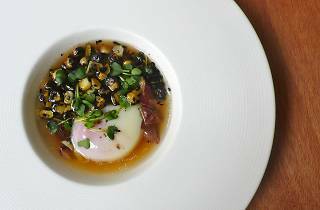 The frothiness of the egg enmeshes with the slightly grainy squid ink, forming a slick broth, while the fish is a crackling companion that we find best eaten when dipped into the resultant mixture. The asparagus mixed with miso, orange, black olives and petite pieces of poutargue also get us nodding in agreement, as the vegetable’s optimal crunchiness is highlighted with the slightly citric flavours it’s cooked in. For mains, the scallops come seared just a little, and the soft portions are a fine centrepiece for the cauliflower, anchovies and lemon juice to sink into. Those in the mood for something a bit more filling can opt for the lamb. Served with morning glory, dry anchovies, lemon olive juice and fried garlic, the produce in the dish is fresh and seasoned in such a way that the flavours come blooming through. Even the side of potatoes melts in our mouths. An assortment of sweet dishes is offered at the end of the meal. The chocolate cream pistachio is a solid conclusion, but we highly recommend the cheese platter (add $60) or the baba au rhum. The latter, a rum-soaked cake with a creamy and slightly lemony sauce, is definitely one for those who can handle their liquor – just a small spoonful already has us feeling a bit tipsy. Serge et le Phoque B2, G/F, Tower 1, The Zenith, 3 Wanchai Rd, Wan Chai, 5465 2000. Mon 7pm-10.30pm, Tue-Sat noon-2.30pm, 7pm-10.30pm.